I knew when I wrote Colorless Eldrazi Stompy Mini-Primer: Play Tips that I was leaving out plenty of juicy information. Not on purpose, of course; there’s just only so much I can fit in one article, or that comes to me at one time. It’s been recently pointed out to me by spectators that I navigate the phases of each turn very deliberately with the deck, and I realized I’d never actually read a piece on this particular area of theory, let alone written one. Phases are an important resource players have access to during a game of Magic—one that can be used to deny opponents of resources, such as mana, or buy ourselves resources, such as information. Just a Phase seeks to address the lack of content on phases. I’ll start the article with some more general phase theory and then move into specific interactions, using Colorless Eldrazi Stompy as the primary reference deck. I say “primary” because this series aims to cover phases as they apply to Modern generally, and isn’t exclusive to my deck. This first article delves into the nuances between upkeep and draw step. Before we get started, here’s the reference deck and a quick blurb on where I’m at with a post-Dominaria list. Updates to the deck since my last posted list are minimal. The mainboard remains unchanged; it turns out I was right on the money about 4 Void. 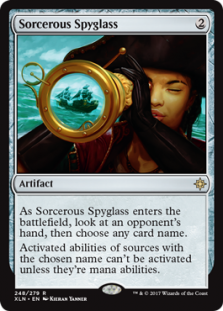 Sorcerous Spyglass replaces a Ratchet Bomb and the Pithing Needle in the sideboard to help with the Tron matchup, which at the moment is a bit too close for my tastes. How it basically shakes out is that Spyglass is better in this matchup and Needle is better everywhere else (Jeskai can go either way). We aggressively keep turn one Chalice hands against Tron, but still need the effect for Oblivion Stone in many games, so Needle has a lot of tension with our plan in this matchup specifically. If the matchup improves dramatically, I’ll cut one Spyglass for either Bomb or Needle, and maybe bring the other card back over the second copy as I continue to improve. Upkeep and draw step have a lot in common: they both occur after a player untaps, but before that player receives an opportunity to cast sorcery-speed spells. There are two differences between them. Major: how many cards players have access to. By the time players receive priority in the draw step, the active player has already drawn for turn. Acting in the upkeep denies that player their draw for a particular interaction. Minor: how cards interact with each phase. Dark Confidant, Aether Vial, and Howling Mine are examples of cards with triggers in one of these phases, and can therefore affect how players wish to interact with them. Subsequently, there are two immediate reasons to act during the upkeep: denying opponents a draw and sequencing plays around certain triggers. As most players understand it, the rule about acting on an opponent’s turn is to do so as early as possible. The reverse is true for one’s own turn. This second rule is easiest to explain; FNM-goers are quick to explain to newbies that immediately slamming lands and creatures, while perhaps automatic, is strategically detrimental. Rather, players should draw a card, make their attacks, and then add more creatures to the fray in main 2, denying opponents information about how the board might look next turn while they must make decisions in the combat step. Main 2 is the latest possible time players can play lands and sorcery-speed spells. The former’s a bit trickier, as it’s less intuitive to a newer player why they might want to act on an opponent’s turn at all. Of course, seasoned Modern players know of many such instances. Say an opponent has four blue lands untapped and a Restoration Angel in play. It makes more sense to throw Dismember at it during the opponent’s turn, since doing it on our turn gives them an opportunity to spend that four mana on Cryptic Command. Passing the turn asks opponents to either burn the Command bouncing a permanent and drawing (which also gives us a window to cast Dismember), or just take their turn without spending that mana. So in this case, waiting a turn denies the opponent four mana. Which brings us to acting in upkeep. In the above example, we’ve decided to Dismember the Angel on the opponent’s turn. But when? Killing it in the upkeep denies our opponent their draw for the turn for this particular interaction. If the Command is actually on top of their deck, they won’t have the luxury of countering Dismember. Or if it’s another threat, they might not mind if the Angel dies, making them less likely to spend mana protecting it in a scenario where they have that information. Generally speaking, it’s indeed ideal to deny opponents of as many resources as possible. Information is one such resource, and one critical to making effective plays. Acting in the upkeep lets players looking to move on the opponent’s turn deny those players information while they make that move. Other situations call for upkeep action because of specific triggers. Dark Confidant‘s the easy one; Bob provides literally a draw, so similar rules apply. Something like Aether Vial, which generates mana, can prove more complicated. It comes up every so often that I’ll have Ratchet Bomb on one counter to my opponent’s Aether Vial on two counters. I could crack the Bomb on my main phase and nab the Vial right away, but that gives opponents the opportunity to flash in a creature first. Such a play might be worthwhile if I want to assess the battlefield for an attack, as nobody wants to run Eldrazi Mimic into Thalia, Guardian of Thraben. Otherwise, I’ll wait until their upkeep. Should opponents tap the Vial on my end step, I can decide whether to tick Bomb up again and kill what they’ve put on the board, or pop it now to deny them another turn of Vial mana. Critically, I’ve lost nothing by waiting this long—only gained information. Opponents sometimes wait with their Vial activations for this reason: they don’t want us to tick up the Bomb at all, and are trying to bait its activation to clear the path for their creatures. Recognizing that plan early lets us leverage the extra tempo by getting more aggressive and forcing them to play into our disruption. Should opponents simply take their turn without putting a creature into play, I’ve gained valuable information about their hand. They’re unlikely to have many two-drops, if any. And they’re also likely to call a Vial trigger in the upkeep to start putting three-drops into play. If I’m in the market for blowing up Aether Vial at all, this is where I respond by cracking Bomb, regardless of whether opponents intended to actually add a counter (that decision is made upon the trigger’s resolution). Now, opponents don’t get to put a three-drop into play, let alone a scary one like Flickerwisp that can save Aether Vial from destruction. And if they were planning to merely draw without adding a counter, acting in upkeep denies them the chance of drawing a two-drop for turn and putting it into play with Aether Vial. They can tap Vial for the two-drop they held off on producing last turn, but that’s fine, too, since we’ve effectively denied opponents a turn’s worth of Vial mana by waiting with Bomb. This one’s relatively straightforward: some effects shine brightest when opponents have more cards. Vendilion Clique and Thought-Knot Seer (given pseudo-flash via Aether Vial) are examples of creatures expertly deployed in draw. If opponents draw after, they might find something even better than what we took. Spells and abilities that force opponents to search their libraries are plentiful in Modern, with Path to Exile, Field of Ruin, and Ghost Quarter among the most popular. These effects all improve when opponents have fewer cards in their decks, since opponents will have a harder time finding cards to search out with those cards gone. Path to Exile is often reserved for an opponent’s turn because it gives them a tapped land in exchange for brutal efficiency. Tapped lands can’t be used the turn they come into play, so a main phase Path gives opponents one more resource for next turn. Pathing a creature during the draw step prevents opponents from using the land from Path this turn, and also gives them the opportunity to naturally draw the land they would have found with Path. That said, it’s often better to throw Path in upkeep, and rarely right to do so in draw. Combat creatures, utility creatures, and lands alter the above “rules” based on the phase they become valuable in during a turn. Creatures are primarily used for combat, and sometimes do little in other phases. Take a combat-exclusive beater like Tarmogoyf. Most Goyf-slingers are in Jund colors, so they won’t have countermagic; baiting responses in the upkeep before they see their draw doesn’t do much for us. We’d rather wait until opponents attack with Goyf, or consciously choose to leave it as a blocker and end their turn, to remove it. By then, opponents have already drawn for turn, so the basic for Path may be out of the deck. But there’s still no reason to remove Goyf before main 1, since doing so gives opponents a clearer board picture with which to make plays for the turn. It’s usually ideal to Path combat creatures in upkeep (vs. decks with possible answers) or as late as possible (i.e. when they attack or on end step), and not in draw. Certain creatures gain value earlier than the combat step, and it can be correct to Path these in draw. It’s no Modern all-star, but we’ll use Captivating Crew as a first example. Crew’s ability can only be activated at sorcery speed, making it useful as of main 1. Pathing it in draw denies opponents the ability to activate Crew in their main phase, gives them the land tapped, and introduces the possibility of Path not finding anything. For a more subtle, but Modern-relevant, example, look no further than Scavenging Ooze. Ooze gains value depending on the number of green sources players have on the field. In the main phase, the active player can play a land without passing priority. Waiting until combat to Path the Ooze gives opponents the ability to drop Forest and exile an additional card from our graveyard. Conversely, hitting it in our main might ramp opponents into something like Bloodbraid Elf, and firing off Path in upkeep doesn’t give opponents the chance to draw their last basic. Here, it can be ideal to Path the Ooze in draw. Lands are similar to these utility creatures, as they gain value as early as main 1. That’s when they can be used to cast sorcery-speed spells. Even many Modern dabblers are familiar with the age-old, draw-step Quarter crack on a Tron land. Ghost Quarter must destroy the second Urza land before main 1, so Tron players can’t assemble Tron and cast Karn Liberated with their seven mana. And since Tron decks historically play few basics, it rapidly became common knowledge to throw Quarter in draw rather than sacrifice it in upkeep. After all, Tron has nothing to do with the extra information from another draw, and there’s no real chance they topdeck a Squelch! 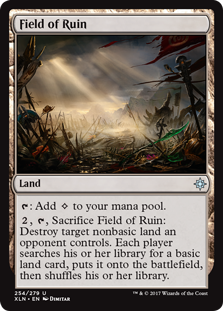 The next level is destroying color-producing lands before opponents can tap them for the right colors. For a high-profile example, consider the match between Reid Duke’s Jund and Paul Cheon’s BG Rock in the Team Modern Super League back in February. Paul aggressively targeted Reid’s red sources with Field of Ruin, prompting some Jund players to begrudgingly accommodate a Mountain (Reid not among them). A few seconds after the above linked video comes in, Paul fires off Field in his main, preventing Reid from untapping with red and having Lightning Bolt or Kolaghan’s Command. But it’s sometimes better to wait until draw for this kind of effect—if, for instance, the only red spell we care about is Bloodbraid Elf, and we’d love for opponents to throw a Bolt or Command at nothing. I Quarter opponents off colors quite frequently in Colorless Eldrazi Stompy, even if they can just fetch up another source. Knowing how many basics each deck plays is crucial to success with the strategy. CES is aggressive enough that opponents may not be in a position to Lava Spike themselves for the right color. I sometimes find myself cracking Quarter after damage if combat goes a certain way, and I anticipate my opponent will need a certain color in main 2. But it’s more common for me to blow up lands in draw. One big reason to hit utility lands or creatures with Ghost Quarter or Path to Exile is to force their activation. Say opponents are looking for an out to our Thought-Knot Seer. If we Ghost Quarter their Desolate Lighthouse on upkeep, they can activate it for an extra look. But doing so costs them a net three mana, complicating non-Path outs like Supreme Verdict or Snapcaster Mage. The main idea with forcing activations is to bait opponents into committing resources to a play (i.e. spending mana on a loot) while depriving them of other resources (i.e. the information gained from their draw for turn). To wrap things up, I’ll give an example of forcing activations that came up for me at a local tournament this week. My Jeskai opponent had four mana-producing lands in play, including Steam Vents, Hallowed Fountain, and Celestial Colonnade. So did I, including two Quarters and a Mutavault; I also had Smuggler’s Copter and Eternal Scourge. I wanted to attack with Copter this turn and loot away a Serum Powder, but put my opponent on Lightning Bolt. In my upkeep, I Quartered his Steam Vents. He tapped for red and searched up Mountain. Here, I could Quarter his Mountain, but he could then spend the mana from both destroyed lands to animate Colonnade and have a blocker up this turn. So I moved to draw step, drew for turn, and then destroyed the Mountain. He again floated red and searched up an Island. Next, I moved to main phase, crewed the Copter, and went to attacks. Crewing in main 1 ensured that if my opponent tapped my team with Cryptic Command, I would be able to animate Mutavault in start of combat and still sneak in some damage. He ended up Pathing the Copter, so I did get in with Mutavault, and was able to land an unchecked Smasher the following turn to close out the game over a few attacks. Understanding phases as a resource is key to wielding them effectively. The marginal benefits gained from proper phase play add up over the course of a game, a match, and certainly a tournament. Things get even denser when it comes to flexible hosers like Relic of Progenitus and Surgical Extraction, which I’ll cover in a future episode. Until then, do you have any interesting phase stories? Share them with me in the comments! Please keep putting out these kind of articles! I play mill, and use the untap phase with mesmeric orb. I used to play surgical extraction, but because relic of progenitus has become so widespread (Possibly due to br-hollow one, dredge and living end) I’ve started playing extirpate to avoid being hosed. Really cool article! The kind that makes you improve as a player. Can’t wait to read the rest of the series! Why do you have gemstone caverns in the side? Do you really feel that it warrants a sideboard slot? I missed the third copy too much on the draw. Obviously it’s our worst land by a huge margin on the play, so since it’s dead in 50% of game 1s I cut one. I just finished 7-2 and in 18th place at the Atlanta Classic using your newest list. The deck feels amazing, and the Void is a definite upgrade as far as lands go. With losses only to UR Breach and Lantern, it was a solid series of games. My two losses came to Lantern, which just seems miserable when you’re only solution to Bridge is Ratchet Bomb and they can search Pithing Needle, and UR Breach; which I lost in three games. I cast scores of Eldrazi from under Blood Moon using Serum Powder but walked right into a Snapcaster EOT attack for lethal after being beaned by Emrakul leaving me with a few lands and an Eternal Scourge. I ended up playing Jund twice, Affinity twice, 8 Rack, Humans, and Ponza in addition to those two. With the exception of Humans (which I won with Gutshot for exactcies) every match felt like a complete breeze. Affinity was tough game 1, but post-board matches were so by the numbers it’s almost frightening. Jund…man, I would play against Jund all day, every round, if it were possible. Deck is fire, and I’m likely to be on it for a long while after now.